Get Involved. It's the motto of our American Legion Post 63 here in Cape Girardeau, Missouri. Getting involved is a primary reason why more and more dedicated veterans and their families continue to devote their lives to their country. And since 1919, it's this same background of involvement that makes American Legion Post 63 an integral part of our community and the American Legion family of nearly three million members worldwide. Note: If you cannot open an Adobe PDF file, right click the link , then click "Save As Target" and save the PDF file on your hard drive at a location of your choice. The you can open the file from that location, provided you have previously downloaded "Adobe Reader". You can add this web site to your Bookmark or Favorite list by pressing Control/D on your keyboard. 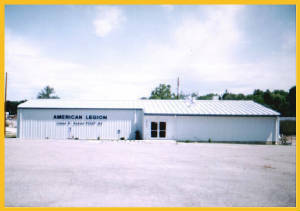 We invite you to visit us at our new post building located at 2731 Thomas Drive, Cape Girardeau, or attend an American Legion Post 63 event. We are happy to answer any questions you may have about our Legion post and how you can become a member of the largest veterans organization in America.